Implementing and scaling Hadoop to analyze large quantities of data is enormously complicated. Unforeseen, very challenging problems are to be expected. 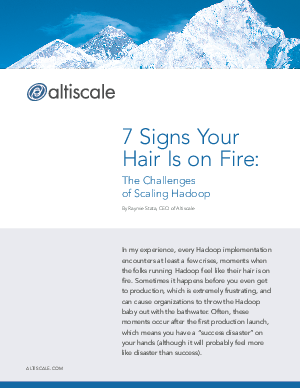 However, if you can learn to recognize the problems before a fire starts, you can prevent your hair (and your Hadoop implementation) from igniting. From the Hadoop experts at Altiscale, here are some of the danger signs and problems you should watch out for, as well as real-world lessons learned for heading them off.